(Nanowerk Spotlight) The discovery of graphene has not only generated massive research efforts to unlock its potential (read our nanotechnology primer: graphene – properties, uses and applications), it has also spurred researchers to pursue alternative versatile two-dimensional (2D) materials for electronic, optoelectronic, catalysis energy storage, and sensing applications (see for instance our recent Nanowerk Spotlight: "Novel mono-elemental semiconductors: arsenene and antimonene join 2D family"). Experiments with graphene have revealed some fascinating phenomena that excite nanotechnology researchers who are working towards molecular electronics. It was found that graphene remains capable of conducting electricity even at the limit of nominally zero carrier concentration because the electrons don't seem to slow down or localize. This has to do with the fact that the electrons moving around carbon atoms interact with the periodic potential of graphene's honeycomb lattice, which gives rise to new quasi particles that have lost their mass, or 'rest mass' (so-called massless Dirac fermions). This means that graphene never stops conducting. While graphene has been shown to host the fastest carriers of electricity yet found, compared with silicon, however, graphene is not a semiconductor because it can't switch between conducting and not conducting states. This makes it very difficult to apply it in a switching device such as a transistor. This is the reason why elemental sheets of silicon (silicene; read more: "Progress review in the materials science of silicene") – and more recently germanium (germanene; read more: "Graphene gets a cousin in the shape of germanene") – have been emerging as strong contenders in the realm of 2D materials. Theoretical studies have assessed the fundamental properties of silicene and germanene but experimental analyses are just in their infancy. Some studies predict that such elemental sheets may also possess Dirac fermions similar to graphene and much simpler techniques may become available for their bandgap engineering. Although semi-metallic, the main hurdle experienced in realizing silicene and germanene is that unlike graphene, they do not form a van der Waals layered structures in their bulk phase. Hence, they do not exist as freestanding sheets but synthesized as adlayer structures on ordered substrates. Very recently, phosphorene which exists as a freestanding 2D nanosheet, has also been introduced to the family of elemental materials, as an excellent semiconductor with graphene like properties (see: "The extended stability range of phosphorus allotropes made of nanotubes"). A recent review in Small ("Elemental Analogues of Graphene: Silicene, Germanene, Stanene, and Phosphorene") provides a comprehensive analysis of the fundamental properties, synthesis approaches and the future prospects of silicene, germanene, stanene, and phosphorene. In a first section, the authors from RMIT University cover the literature on the fundamental properties – elemental structures as well as electronic, mechanical and thermal properties – of graphene analogous elemental sheets, inclusive of both theoretical and experimental knowledge. However, most of the properties discussed therein are based on theoretical analyses as the lack of an established facile synthesis technique has proved to be a hindrance to experimental studies. Although there is a lack of knowledge on the fundamental properties of germanene and stanene, the striking similarity in their crystal and electronic structures, enable the properties of germanene and stanene to be extrapolated through comparisons with graphene and silicene. In the next section, the authors discuss various bottom-up synthesis techniques and top-down exfoliation (chemical, mechanical, and liquid) approaches for the fabrication of two-dimensional elemental sheets. The review concludes with the observation that "the lack of progress in facile synthesis techniques has limited the experimental advances to support most of the theoretical predictions. So far, the available synthesis approaches in producing graphene analogous Group IV elemental materials, have been limited to substrate assisted epitaxial growth. Such a limitation is expected due to the metastable nature of these elemental sheets. Alternative approaches to produce such 2D sheets and cleaving them off their growth substrates are yet to be explored. 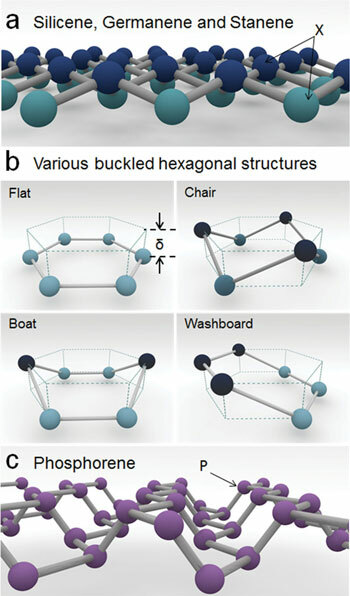 Phosphorene on the other hand, is a stable, freestanding 2D material and black phosphorus has already been realized using chemical transport techniques. However, facile bottom-up growth techniques for realizing monolayer phosphorene is yet to be demonstrated in order to realize the true potential of phosphorene. As such, advances in synthesis techniques for producing graphene analogous 2D elemental sheets will be a significant milestone towards harnessing their tremendous potential for the development of next generation of electronic, optoelectronic and spintronic applications."